Bullion is gold bars, silver bars, and other bars or ingots of precious metal. The word bullion comes from the French Minister of Finance under Louis XIII, Claude de Bullion. The value of bullion is typically determined by the value of its precious metals content, which is defined by its purity and mass. To assess the purity of gold bullion, the centuries old technique of fire assay is still employed, together with modern spectroscopic instrumentation, to accurately determine its quality in order and ensure the owner receives fair market value for it. It is also weighed extremely accurately. Retailers may sometimes market ingots and bars of base metals, such as copper, nickel, and aluminium as bullion, but this is not a widely accepted definition. 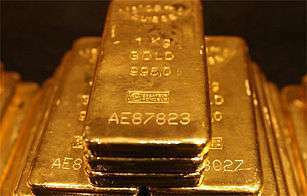 The London bullion market is an over-the-counter market for wholesale trading of gold and silver. The London Bullion Market Association (LBMA) coordinates activities of its members and other participants in the London bullion market. The LBMA sets and promotes quality standards for gold and silver bullion bars. The minimum acceptable fineness of the Good Delivery Bars is 99.5% for gold bars and 99.9% for silver bars. A range of professional market participants is active in the bullion markets: banks, fabricators, refiners and vault operators or transport companies as well as brokers. They provide facilities for the refining, melting, assaying, transporting, trading and vaulting of gold and silver bullion. Besides the direct bullion market participants, other professional parties like investment companies and jewelers use bullion in the context of products or services which they produce or offer to customers. For example, shares of the world’s largest Gold exchange-traded fund, the SPDR Gold Shares represent ownership in vaulted gold bullion. Occasionally, consumers who are unaware of the intrinsic value of a coin will use it as normal currency. If a coin is taken to a bank, the bank can only pay the face value of the coin. However, if it has intrinsic value, it is worth much more.